And welcome to the long-overdue return of the Guitar Noise Podcast series. Since the May 2010 Guitar Noise Topic of the Month is Finger Picking (or it will be once May starts! 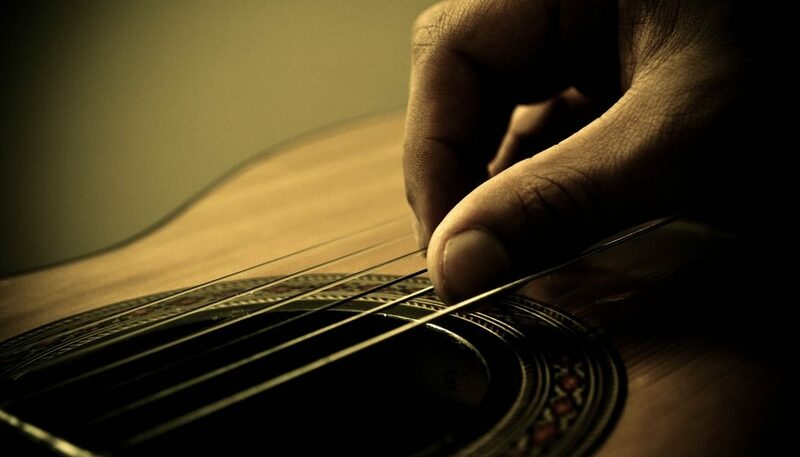 ), it seemed like a good idea to show how you can add simple techniques you already know from single note playing and strumming to spice up your finger picking playing as well. In this Guitar Noise Podcast, we’ll start with a simple Travis style picking pattern with the G major chord and then add two interesting twists to it, one that will make you sound a little like Gordon Lightfoot and the other like Paul Simon. I hope you enjoy the lesson. As always, please feel free to post your comments or to send them to me directly at dhodgeguitar@aol.com Thanks for listening and I look forward to chatting with you again soon. I wanted to thank you for publishing these podcasts. I am a blind person learning how to play the guitar…the materials for this are rather limited and these podcasts have been so valuable for me. I really appreciate all of them and I’m really excited that you are moving into finger picking (my favorite way of playing). Keep them coming and thanks again. Great podcast, I can’t wait for the next one with more advanced picking patterns! Welcome back David!!! I missed your podcasts. The fingerpicking lesson is great….looking forward to the next one. Great podcast! Learned alot…but please lose the echo on the narration! It’s like amateur night down at the ‘Pig & Whistle’. Will be tuning in again! But… could you please change the host? You’re a good host, nothing personal against you, but your voice is not really meant for the radio(internet) waves. Loving this podcast. Will there be more??? And Martin is crazy. David, keep up the great work. I hate to be the bearer of bad news, but there will be more Guitar Noise Podcasts soon and, for better or worse, you’re stuck with me doing them. Sorry. And my apologies for it being so long between the last one and the next one (hopefully before the first of April) – between all the book deadlines and many other factors the time it takes to plan out and create these podcasts has been hard to come by. We’ll definitely pick up right where we left off with last one, though. As always, thank you for both your patience and support. And while I understand my voice is a bit of an acquired taste, hopefully there’s enough to learn and enjoy that it can be overlooked for the length of any given podcast. Dear David, I am only in the first of your podcasts (number 4 to be precise) but I find them the best guitar teaching resource I’ve ever come across, and I’ve definitely made more progress and gained more confidence from them than from anything else (and I’m not given to hyperbole). You’ve a knack of taking something very simple, like the Em chord, and making a piece of music out of it on its own. Plus I really like the way you sneak in things that to a beginner – like hammer-ons – seem really daunting, yet you show them not to be. I’m delighted to hear that you’ll be back on the airwaves with more. PS I think you’ve a great voice – very friendly and encouraging; ideal for a teacher. Thank you for writing and thank you very much for your kind words. I’m glad that the Guitar Noise Podcasts are being of help and I’m hoping to get them going again on a regular basis in the very near future. In the meantime, though, you should feel free to go through them at whatever pace is best for you. And you should also feel free to write whenever you’ve a question or suggestion or even just want to say hello. And I’m always lookiing forward to hearing how people are progressing. Be chatting with you again soon. I had stumbled upon this site awhile ago and was quite sad then that the podcast seemed to be ‘dead’, because I think it’s absolutely brilliant and extremely helpful for a beginner like me. That would be highly appreciated! I just sent them off via email. Please let me know if you don’t get them. And I’ll dash off an email to Nick, the head Moderator at the Guitar Noise forums and see if he can’t get you back up and going on the Forum page. Hope you’re having a great weekend and I’m looking forward to chatting with you again. Thank you very much, David, I got the notes! Looks like an excellent addition to the podcast, so thanks also to Mike / Rum Runner for putting them together! Would be nice if I could register to the forum, so I’d be glad if you could help me with this. I apologize beforehand for echoing (“me too”) what Aidan wrote on March 17, 2011 and adding a very lengthy, “schmaltzy” elaboration about how much I found Podcast #28 to be nothing short of enlightening. For more years than I care to admit, I’ve been using a plectrum on electric guitar (rhythm and lead / solo), yet had a deep interest in finger picking but considered it to be well out of reach for me. Podcast #28 caused me to set my plectrum aside, learn to change my “strumming” right hand to adopt a “cupped” position (as Jamie Andreas aptly describes it), and give finger picking a try based on said podcast — which I listened to many times, trying to follow along. Much faster than I had ever expected, I was able to “get it”, owing in no small part to your lucid and finely-graded exposition. I just amazed myself at sounding like Gordon Lightfoot and Paul Simon, “as advertised”, and within a brief period of time! I didn’t ditch my plectrums (plectra? ), but I am now starting on the finger-picking path with a solid foundation that you so generously provided. For this — and so many other things *including* music theory — I am forever indebted to you, Mr. Hodge. PS: Apologies for my tentative English; I am French. Are the podcasts just audio or should I be seeing video? The Guitar Noise Podcasts are audio, not video. Well It’s been a long while since a podcast. Will there ever be any more additions to the podcasts or any lessons for that matter. There definitely will be both new podcasts and new lessons. And by “new lessons” I’m assuming you mean song lessons as we’ve had new lessons going on all the time. Unfortunately most of our energies this past year have been devoted to working out the necessary details involved in working out copyright agreements to bring the song lessons back to the pages of Guitar Noise, which has finally been successful. Part of that arrangement was to also work out the negotiations for the use of songs for brand new song lessons. Additionally, I’ve also been involved in a number of other projects which have had to take priority over the planning, writing and recording of the podcasts. I didn’t mean to go this long between them but life kind of dictated otherwise. With a bit of luck they should be starting up right around the first of the New Year. As always, we appreciate your patience in this. It’s not easy balancing out all the private teaching and group classes in addition to the work I do at Guitar Noise. Hopefully the upcoming new lessons will prove themselves to be worth the wait. This is a great podcast. You do a great job with these. TravisPicking was extremely tedious when I started learning it by myself. I wish i had this as a reference when I go along with it. If you don’t mind, I might curate this podcast in my next blog post when I talk about finger-picking lessons. You have a much greater understanding for this than I do so I want people to understand everything you’re dishing out! I am in love with your podcast. They are simply perfect for newbies like me. The audio lessons come handy. It would be fantastic if I could see some video tutorials as well. As I read on the blog, some pick up early and faster than others while many don’t. Hello, and thank you for this site. Any information I can get is great, I am green as grass when it comes to playing guitar and watching podcast’s. I would imagine that there is a video along with the audio, I hear the audio but cant seem to get the video to the podcast’s. What am I doing wrong?